People ask me how they can get their dogs to calm down. There is no quick fix for that, of course. I recommend a combination of mental and physical challenges – structured walks, obedience training, visiting new places, etc. One good tool to have on hand is the dog backpack. A dog backpack is exactly what it sounds like, a backpack designed for a dog to wear. 1. The backpack puts the dog in a working mode. Sometimes the backpack itself has a calming effect on the dog. This is the case with my dog. When he wears his pack, he knows we’re going on an adventure, but he also knows to be serious. He loves working just as much as he loves goofing off, and that is the case with a lot of dogs. Some dogs can run for 90 minutes, and then they are ready to run some more! But if they work their minds for 20 minutes, they are wiped out. Backpacks are perfect for this. Try strapping the pack on your dog and then walking in a new neighborhood for 20 minutes while working on some obedience commands. All of this focus will leave your dog feeling drained. 2. 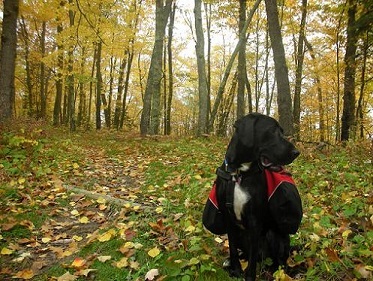 Backpacks can help dogs with leash manners. 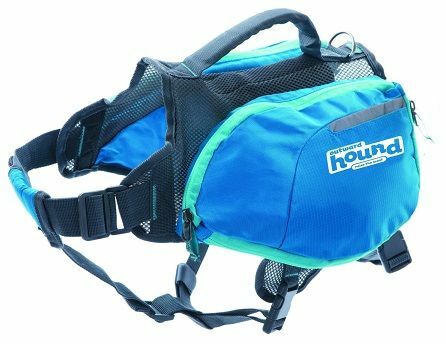 If you have a leash puller or a reactive dog, the backpack won’t be a quick fix, but it might help your dog stay focused. My own dog gets excited when he sees other dogs, and he definitely tries to sneak in front of me. The backpack helps him focus on something other than moving forward. When he was younger I had him wear his backpack and carry a ball in his mouth at the same time. By focusing on these two things, he would forget about pulling. The backpack really helped his leash manners overall. Use one in addition to your current training techniques. 3. A backpack can be used for all breeds and ages. Some people are worried the extra weight could hurt certain breeds due to the extra stress on joints or muscles. This is true. However, it’s not necessary to add any weight to the doggy backpack at all. Sometimes just wearing the pack itself is all that’s needed to give the dog a mental workout. I recommend a dog backpack for all types of dogs – puppies, seniors, dogs with short legs, toy breeds and even dogs with arthritis. The pack itself barely weighs anything. If you’re still concerned, ask your dog’s vet. 4. It’s an extra physical challenge for short walks. 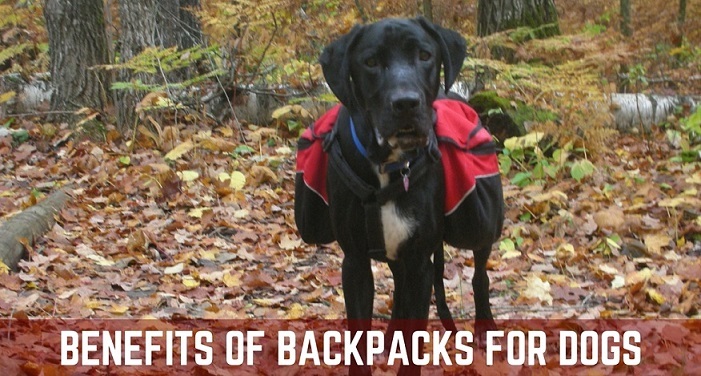 If you do load the pack with weight, it can be an extra physical workout for your dog. You’ll want to use common sense, of course. A rottweiler can handle more weight proportionally than a dachshund. I used to really load Ace’s pack up with soup cans or hard-cover books and then take him on short, 10-minute walks. This was a great physical challenge for him in his younger years. You want to slowly ease into extra weight and keep the walks short. 5. What should I put in the pack and how much? This is a hard question because every breed is different, and every individual dog is different. I prefer to go with less weight. I’ve heard recommendations such as 10 percent of the dog’s body weight, which would be about 7 pounds in Ace’s case. This is too much weight unless you know your dog can handle it. I would start with no weight at all and then slowly add some lightweight objects. Maybe a paperback book in each side for a Lab-sized dog. With time, you can slowly add more weight, such as water bottles, especially for short trips. When I take my dog camping, Ace carries his own food, and it probably ends up being around 5 pounds or so. He does just fine. Just make sure to ease into it. 6. 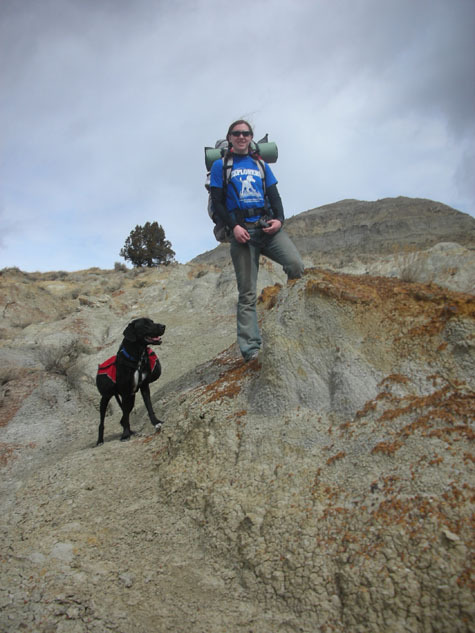 Dog backpacks are a great tool for dog walkers and shelter volunteers. If you are a professional dog walker, or if you walk dogs for a shelter or rescue group, backpacks for dogs are wonderful tools. My foster dogs often come to me with pent-up energy and stress just from living in a pound or kennel setting for a few weeks. A dog backpack, in addition to regular exercise and training, is such an important tool to help them settle in. Does your mutt wear a doggy backpack? Dog backpacks are great! I use it like you do, to indicate adventure or something more than just a regular walk. Another thing to try, if you’re worried about your dog being too small or whatever, is a vest. When I was easing into a pack for my dog I started with a vest. It gives the same general feel as a pack, weighs practically nothing, and the pockets are just big enough to carry some poop bags. Switching over to the backpack was no problem because she was already so used to the vest. I just bought the backpack and the walk went so well!! Hardly any pulling and he was very focused on me! Seems like this would be good for larger breed dogs. What about smaller breeds like rat terriers lol? 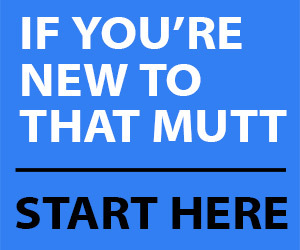 Love your site by the way…very helpful! They’re great for small dogs with a lot of energy. Small dog backpacks are harder to find, but well worth it! Do the doggy back packs help build muscle at all? I want to work my dog out not only to tire her put but to help her look and feel stronger! Our 3 yr old Shep/lab mix has energy for days on end! I thought of getting a backpack for her..she wears me out long b4 she is even on breaking a sweat! Lol. I use a backpack with Okami. the Shelter I rescued her from said she was a husky but I am getting more and more convinced she is really a “small” malamute she is ~2.75 years old at this point and weighs about 60lbs. I actually should be working on my 1/2 marathon training with her, and when we go on the ~30 min, and 2-4 hour walks I often have her carry 2 64oz apple cider bottles ~1/2 full of water one in each pouch so she is carrying ~64oz of water total, and a collapsible fabric bowl. on the short walks its just having her carry some extra weight for a better workout. (so she gets tired sooner) on the longer walks its a convenient way to make sure we have water available for her to have a drink when she looks like she could use it. FWIW, our dog is a rescue that was bullied in the prior owners house by their other dog. She was extremely aggressive to other dogs and people when we got her. We socialized her with other people by having strangers give her treats. Likewise when she was good with other dogs, she got treats. Now, when she is good to other dogs (or people) she expects to be rewarded 1 1/2 years later. Elly is strongly food motivated, so this worked for her. My dog defitinely needs the back pack. However being winter she wears sweater and a coat. She weighs 8 lbs ( she is an adult) so i am wondering what size back pack will fit her now and still fit when weather warms and she doesn’t need sweater and coat ? If she’s 8 pounds you’ll need the smallest size pack with or without a sweater but best to measure her chest ad waist and length. Most companies have a size chart for reference.